HOW DO BULGARIANS CELEBRATE SAINT TRYPHON’S DAY? During the month of February, an exhibition was shown at the Ethnographic Museum in Plovdiv to depict folk traditions related to St Tryphon’s Day celebration. The Day of St. Valentine is celebrated in numerous countries on 14th February. 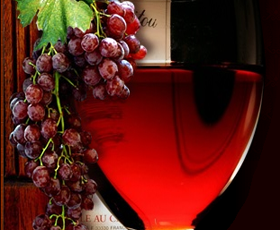 However, on this particular day, Serbia celebrates a holiday dedicated to wine and vine, equally celebrated by vinegrowers, wine-makers and restaurant & cafe owners across Serbia, as well as numerous winelovers. WOULD YOU DRINK WINE FROM A BABY BOTTLE? Paris, Montmartre, street musicians, wine, couples in love, artists on the street, romantic bistros and restaurants. This is how most of us imagine a visit to the French capital. However, one of the local attractions of Montmartre is a tiny restaurant that serves wine in baby bottles instead of glasses. Armenia is one of the cradles of wine production where wine has been made for centuries in traditional clay amphorae called karas. Unfortunately, in modern Armenia, this traditional craftsmanship is almost extinct. While the winding road is taking us to the village of Sekurič, autumnal landscapes and locals from the nearby villages who stop their work curiously turning their head to see who’s arriving by car remind me of scenes depicted on Janko Braštić’s paintings, certainly the most famous artist from Rekovac. Alta Langa covers hilly areas in the municipalities of Alessandria, Asti and Cuneo, in the north of Piedmont. It is also a recent Italian DOCG appellation, established in 2011 which centers its identity around sparkling wines made by traditional (classical) method.